Kevin from Spinistry is at it again with the infamous Sansom 66. 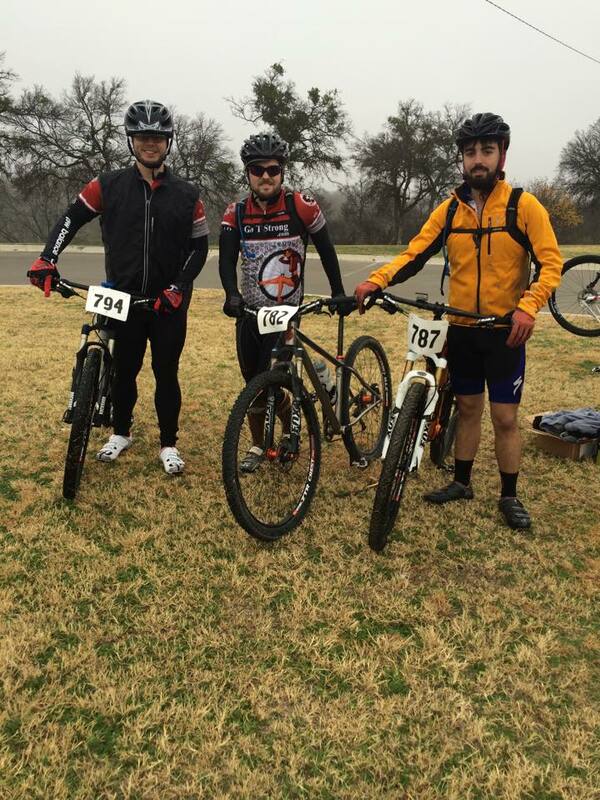 The Sansom 66 is an endurance race with a 33 mile and 66 mile option. As Kevin said, “many people will attempt it, but few will complete it.” Sansom is not your “typical” DFW trail. There is approximately 1500+ feet of elevation per each 11 mile lap. The terrain is tough with tons of loose rocks, an abundance of climbs, fast descents, and maybe one straightaway to recover. This trail can be very fun, but also very challenging, and guess what? The racers did every bit of it! A few of our teammates signed up for this torture, ahem, race. Braden Barnett, Daniel Smith, and Evan McGinley registered for the 33 mile option, which is pure insanity in itself. 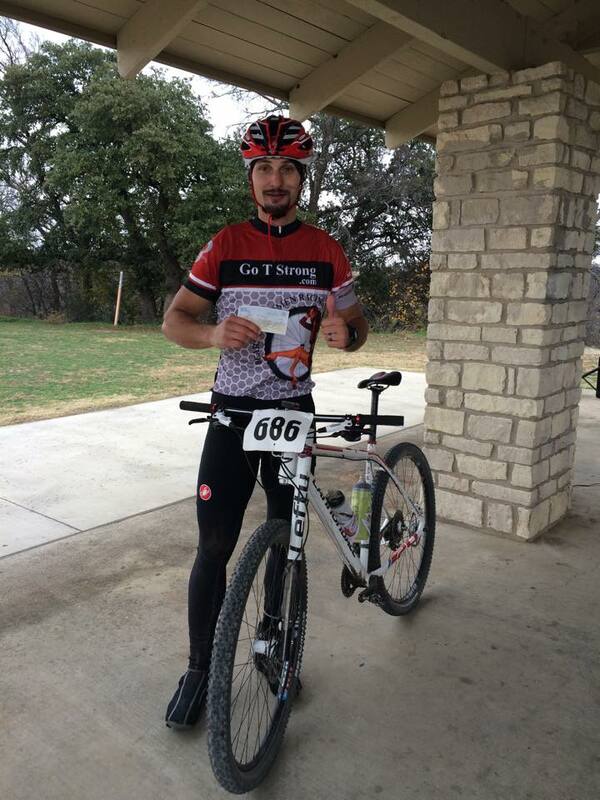 Yavor Gerenski and Brad Wendling did the unthinkable and signed up for the 66 miler. The race morning started out as any other except it was a bit chilly and drizzly. Kevin gathered the racers for the usual racers’ meeting and then the riders anxiously took their spot on the starting line. Within a few minutes the racers were off! Brittany, Melissa, Jonathan, and Emma were on standby for support. The ladies immediately took off on foot to find a good spot to take pictures of our teammates and offer them a cheer or two. We won’t mention how they didn’t actually ever find the racers… That’s beside the point. They were still great to have onsite as they were ready with nutrition and water as BWR came through on each lap. Yavor and Evan were the first to come through on the first lap. Not far behind them was Brad, then Braden, and then Dan. All of them were looking very strong as they immediately jumped into their second lap. As everyone came through for the second time, you could see a mixture of emotions on their faces. However, they were all determined to show Sansom who was boss. One lap later our 33 milers crossed the finish line. Evan killed it with a time of 3:14:46. Braden came in next with a time of 3:52:20. Dan also finished with a very solid time of 3:57:11. Any person who has ever attempted to ride Sansom knows that 33 miles of that place is absolutely nuts and a HUGE accomplishment. Way to go, guys! You totally rocked it! As time passed, the BWR pit crew (Brittany, Melissa, Dan, and Braden) continued to wait, help, and cheer on Brad and Yavor. Brad even got a leg massage in between laps. Talk about service! Both continued to look strong as they pushed on. After the fourth lap, Brad decided to throw in the towel due to some wicked leg cramps. We still felt so proud of him! Did I mention that he did all of that on a single speed?! Four laps out there on a single speed earns him bragging rights for a very, very long time. We still had Yavor out on the course and we could not even believe he still had enough gas in the tank to keep going. Braden, Dan, and Brittany waited anxiously for Yavor to complete his final lap. As soon as they spotted him towards the end of the course, they ran over to him and began yelling and cheering for him. You could see the excitement on his face (I know, hard to believe). HE DID IT! He finished the grueling Sansom 66 with a time of 6:42:28. As he crossed the finish line, Kevin handed him his payout and everyone congratulated him. Way to represent, BWR! Y’all did an amazing job!